When talking about bean sprouts, most people think of mung (or moong) bean sprouts, which are the most commonly used bean sprouts. But a variety of many other beans and seeds can be sprouted, including alfalfa seeds, sunflower seeds, kidney beans, white beans, peas, lentils and adzuki beans. In general terms, bean sprouts are the tender, edible shoots of certain bean plants. They are the result of the germination process, through which the nutritive ingredients found in beans and seeds become profoundly modified. Studies show that germination of mung beans dramatically increased the vitamin C content, and reached the peak on day 8 of germination, up to 285 mg/100 gram, almost 24 times higher than the initial concentration in mung bean seeds. One serving of raw mung bean sprouts of about 100 gram provides 21.6 mg of vitamin C, which could meet 36% of daily value (DV). In addition, the germination dramatically increased total phenolic compounds by up to 4.5 times, and total flavonoids by 6.8 times higher than the orgiinal concentration of mung bean seeds. The total antioxidant activity of mung bean sprouts was increased by 6 times higher than that of their seeds. Why Are Bean Sprouts Good For You? A huge benefit of eating more sprouts is the amount of amino acids and antioxidants that you will receive. The combination of additional amino acids and antioxidants go a long way towards fighting cancer and improving your brain function. Sprouts have a high fiber content that is beneficial for a healthy digestive tract. Fiber binds to fat and toxins inside your body and helps them pass through your system, allowing your body to quickly break down the fat. This improves your chances of losing weight and keeping the weight off. Compared to uncooked fruits and vegetables, sprouts can contain up to 100 times more enzymes. Enzymes are necessary for all body functions and also help with foods digestion. Receiving more enzymes can improve your body’s ability to absorb nutrients and work more efficiently. Foods that are already a good source of protein, such as beans, nuts, seeds, and grains, offer higher quality protein when they are consumed as sprouts. During the soaking and sprouting process, proteins change and their nutritional value peak between days 3 and 8 . Along with providing more protein and fiber than their raw counterparts, sprouts contain more vitamins. You can expect up to twenty times as many vitamins with some seeds, beans, grains, and nuts, including more vitamins A, C, and E, and the B vitamins. With the sprouting process, sprouts also end up becoming a great source of essential fatty acids. Most people do not consume enough omega-3 fatty acids, which are also found in eggs, fish and most seafood. 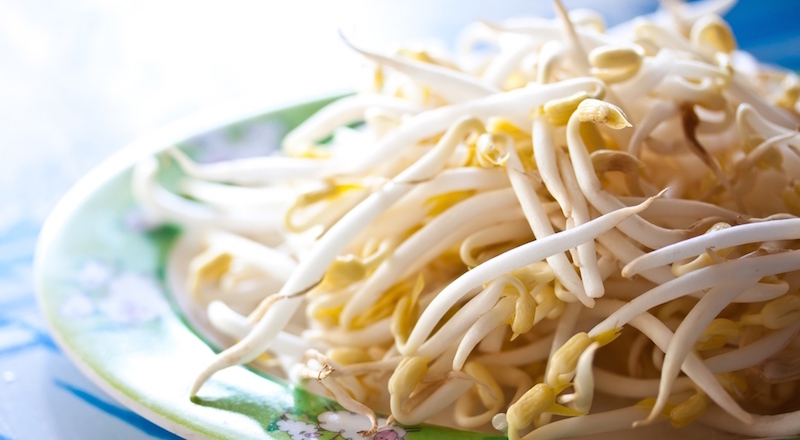 Bean sprouts have been used for centuries for their nutritional and medical benefits. They can be eaten raw or lightly cooked or they can be juiced. Flavor varies from sweet delicate to sharp intense, depending on the type of sprout. Bean sprouts are a true concentrate of energy and nutritive principles. Unlike ripe vegetables, which nutritional value progressively decreases after they have been harvested, bean sprouts retain their nutritional properties until consumed. Bean sprouts have the richest source of amino acids (for protein), vitamins and minerals, and also contain a good amount of fiber. They contain all types of vitamins (A, B, C, D, E and K), folate, and are an excellent source of iron, potassium, calcium, phosphorous, magnesium and zinc. Other nutritional benefits vary depending on the type of sprout. It is interesting to note that mung bean sprouts contain estrogen-like phytochemicals, called isoflavones, which are responsible for some of the many healthy proprieties of these sprouts. 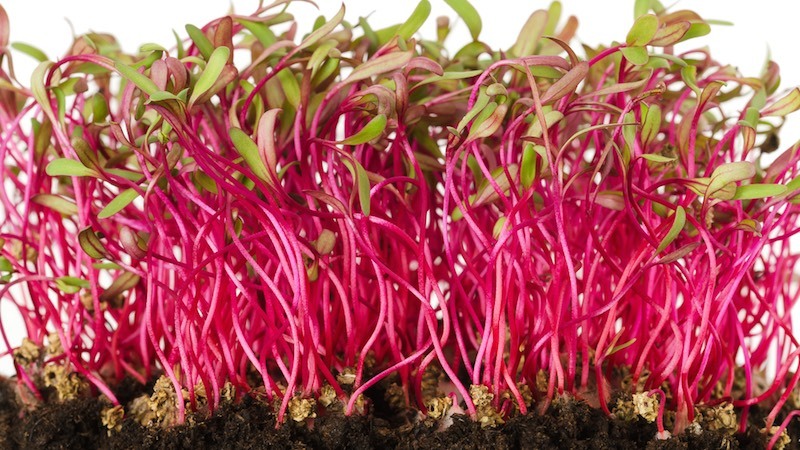 What Are The Healthiest Sprouts To Eat? When it comes to sprouts, not many types of bean sprouts are easily available. If you can get hold of any of the following, they are the healthiest sprouts to eat. Or grow your own. One of the most popular sprouts around the world, alfalfa sprouts are often enjoyed in sandwiches due to its neutral flavor, richness in nutrients and crunchy texture. Beet sprouts have colorful stems in dark red and bright green leaves. Like beetroots, the sprouts have a slightly earthy taste and are sweet. Broccoli sprouts became popular when reseaarchers isolated a cancer-fighting compound called glucoraphanin that makes sulforaphane glucosinolate. Fenugreek sprouts have a bitter taste and best to be added in salads. They are particularly beneficial for female breast health. They contain substantially more organic phytoestrogens than any other sprouts. Often known as pea shoots, these are mild-tasting, often used in Asian cuisine. They have a delicious, nutty and distinct pea-like flavor, and highly concentrated with nutrients and enzymes. Like lentils, the sprouts have a nice, crunchy texture with a rich nutty-flavor. 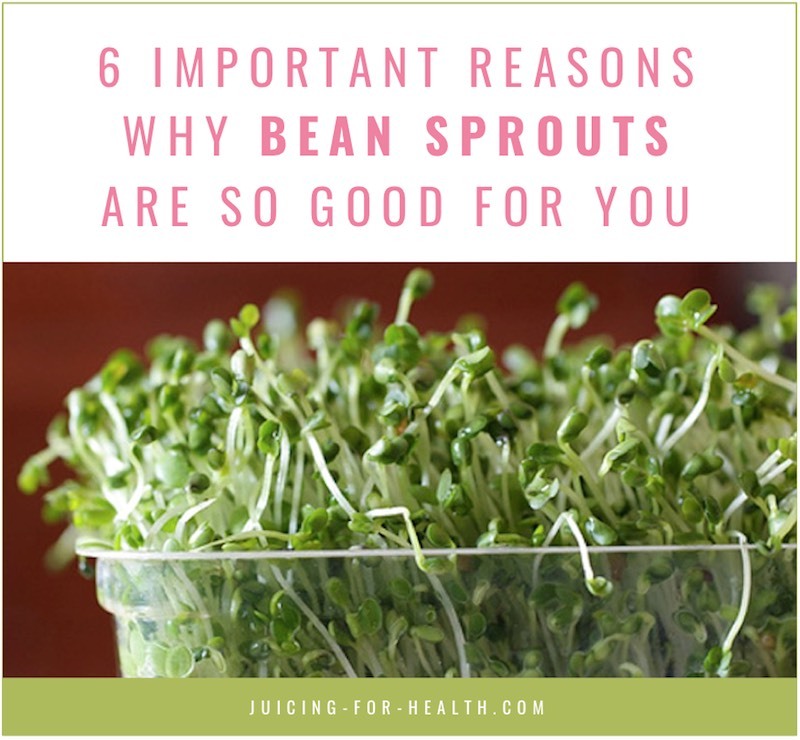 And like all sprouts, they contain the highest amount of nutrients and enzymes when sprouted. Wheatgrass sprouts are more common compared to the other sprouts discussed here. They are best harvested at about the 7th day. Wheatgrass are often not eaten but juiced. The juice is rich in a wide range of nutrients that make it a beneficial drink to be included in cancer diets. Sprouts from all beans and/or seeds are so high in digestible nutrients, vitamins and minerals that they can be considered true multi-ingredient natural supplements. However, here we will focus on the health benefits of mung bean sprouts, which are the most commonly consumed sprouts all over the world and the most studied by researchers. Although these health benefits most likely apply to most bean sprouts as discussed above. Mung bean sprouts (as well as other types of bean sprouts) are rich in iron, which plays a key role in the synthesis of hemoglobin, the protein found in red blood cells. They are also particularly high in vitamin C, which enhances the absorption of iron in the intestines, thereby effectively helping to prevent or treat anemia caused by iron deficiency. A study showed antidiabetic effects of mung bean sprout extracts, when fed to diabetic lab mice for five weeks. It was found that mung bean sprouts lowered blood glucose, plasma C-peptide, glucagon, total cholesterol and triglyceride levels. Also markedly improved, were glucose tolerance and increased insulin immunoreactive levels. When associated with a low intake of saturated fats (found in meat, poultry and dairy products), the regular consumption of bean sprouts can help reduce the blood levels of LDL-cholesterol due to its content in fiber and lecithin. This effect is beneficial to the heart and vessels, since it helps prevent the development of atherosclerosis, the most common cause of cardiovascular disease. Due to their high content in fiber, bean sprouts can help improve intestinal motility and relieve the signs of constipation. The high antioxidant content in bean sprouts is beneficial for improving eye health and preventing eye disorders, such as age-related macular degeneration. By improving your cognitive ability, you can delay the onset of Alzheimer’s disease or slow the progression of the disease. The high content of antioxidants in bean sprouts help neutralize the damages done by free radicals, which not only affect brain functions, but are also known to cause various types of cancer. Bean sprouts are an excellent source of lecithin which, besides lowering blood cholesterol levels, helps reduce liver fat, thereby preventing fatty liver, a common liver condition that can result in liver dysfunction. Mung bean sprouts are rich in phytoestrogens, which have a weak estrogen-like activity. That’s why they can help relieve many symptoms associated with menopause (such as hot flashes and heart palpitations), which are the result of decreased estrogen levels. Phytoestrogens found in mung bean sprouts are also effective in counteracting menopause-related osteoporosis. It has been shown that phytoestrogens found in mung bean sprouts act on certain estrogen-receptors found in the skin, stimulating the synthesis of hyaluronic acid, collagen and elastin, which are vital components of the skin’s structure. Therefore, the regular consumption of mung bean sprouts can help prevent many age-related skin changes, including elasticity and moisture loss. Your body is able to absorb more of the nutrient content of sprouts, thus increasing the efficiency of your digestive process, which in turn helps burn calories and convert carbohydrates into energy more efficiently. Most sprouts can be eaten raw; if cooking them, sauté very lightly or just a quick blanch or light steam. Do not overcook. Whether raw or cooked, bean sprouts can be used in a variety of dishes, including appetizers, salads, side dishes and snacks. They can be juiced as well, but usually added to other vegetable juices. To get used to their flavor, it is recommended to start with a handful of sprouts added to other green juices and then increase the amount depending on your taste. 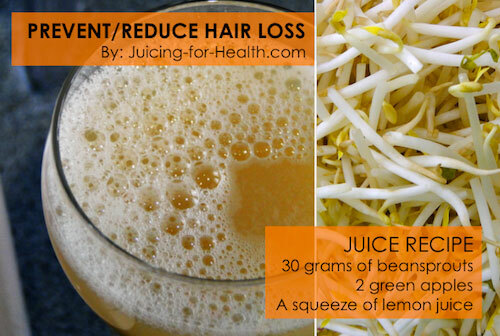 Bean sprouts juice contains these vitamins that are essential for hair health. They strengthen hair and prevent them from breaking and falling: Vitamin A, B vitamins (especially biotin), selenium, zinc and silica. 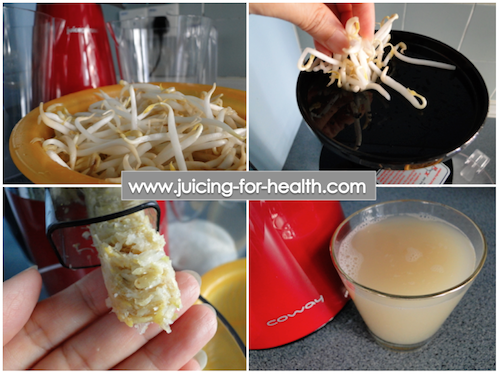 Make this juice and drink regularly. You may also soak your hair with this juice and leave it for about 20-30 minutes, 2-3 times a week for absorption into your scalp for a healthy scalp. 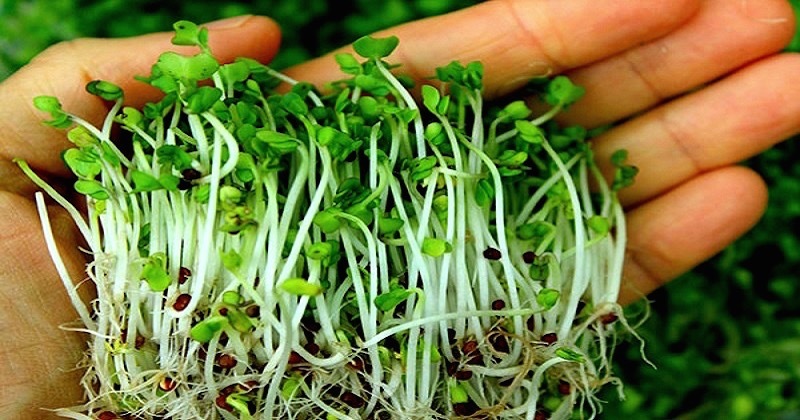 You do not need any special equipment nor experience to grow your own sprouts. When you grow your own sprouts, you are also doing your small part to reduce the production of crops, helping the environment. You will not have to worry about any of the harmful chemicals and toxins found in many commercially grown produce. Sprouting takes only a few days and does not require a lot of work. Go here to learn how to grow your own bean sprouts. Always ensure that sprouts are kept at refrigerator temperature. Throw away sprouts that smell, have turned dark or are slimy. Rinse sprouts thoroughly with water before consumption. Some people are allergic to the proteins found in certain legumes or legume sprouts, and hence they are recommended not to consume them at all.